When the golden beams of the suns light shine through the Spanish moss draped trees at the Edisto Island Presbyterian Church its easy to think that a slow-moving shadow was just that  a shadow  but maybe, it was something else. As far as ghost stories go on the island, the Presbyterian Church, or more specifically, its graveyard, is home to one of the most popular haunts around. This is the story of Julia Legare. Back in the mid-1800s, Julia Legare was visiting family on the island. She became ill and slipped into a coma. Her family anxiously awaited the day she would wake up, but that day never came. The family physician declared the young girl dead. In those days, long before the deceased were treated with embalming fluids to preserve the body before burial, the ceremonial activities surrounding death were conducted at a rapid pace in order to avoid the inevitable decomposition. Poor Julia was buried on the same day of her death after loved ones had a chance to pay their respects. Her little body was taken from the church and interred in the familys mausoleum. After she was placed inside the crypt, the marble door was closed, and securely locked, providing a sense of finality to the tragic death of the child. Julias family went on with their lives as best as they could after suffering the loss of a child so young and in time the pain of her death was replaced with happy memories from her life. After 15 years had gone by, another death in the family required the mausoleum to be opened. It was then that the family realized what a tragic error they had made. 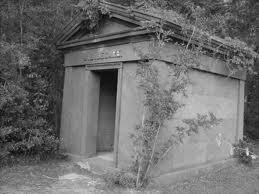 Julias remains, which had so long ago been entombed, were crumpled at the foot of the mausoleums door. She had been buried alive. It is thought that her respiratory and heart rates had dropped so precariously low that they were undetectable by the familys physician and so he declared her dead. When she was interred that fateful day, she was merely in a coma, and not dead. This led to the horrible realization that she had woken up in her own tomb next to the entombed remains of long-dead family members where she was unable to escape and had to wait for her actual death to come and free her of the terror she had woken up to. The girls remains were entombed once again, as were those of the relative whose death led to the grim discovery, and the door was securely closed once again. Still reeling from the horrible discovery at the mausoleum, the girls family members visited cemetery to pay their respects. When they did, its door was open. Thinking that the open door had to have been the result of being improperly secured at the recent funeral, they shut the door again, and walked away. A few weeks later, a clergyman at the church saw that the door was open and ordered it to be closed. This happened again and again and again throughout the decades. Chains and unbreakable locks were used to keep it sealed tight, but they would always break and the door would open. As little as 50 years ago a door was put on that could only be removed by industrial heavy machinery and that door was also opened (little Julia must have been particularly mad at that door because it was not only open but completely unhinged from the mausoleum). door is nothing more than broken marble that sits in the grassy doorway to the tomb. Now that there is no door to the J.B. Legare mausoleum, it is thought that Julias spirit can rest. But there are still some who say that she guards the mausoleum just to make sure that nobody dare get the notion to put a door back on the very building that killed her all those years ago. Visitors head out to the church every year just to walk over to the cemetery and take a look at the mausoleum and walk inside. Some report feeling an essence around them and others claim to have captured images on their cameras that cannot be explained. As for what Julia thinks of it, well, it seems as though she is just fine with people visiting the tomb  just dont even think about shutting the door. I would love to see the pictures. My email address is s_alsept2_boss@live.com and I'm also on Facebook. The email there is mrs.sierrarowe@facebook.com and the url is http://facebook.com/Mrs.SierraRowe. Whenever you have time, feel free to send them. You can friend me if you want. I would love to see the pictures.That graveyard is one of my favorite places to visit when i am on vacation.gonna go home and check my pictures for anything out of the ordinary. We were there on Halloween Day. The sky was grey and overcast and there were no shadows anywhere in the cemetery. We walked around for a bit and read lots of stones. There is so much history to be discovered in the cemetery. I walked over to the Legare mausoleum and got ready to take some pictures. I didn't feel comfortable going in the mausoluem so I stood just outside the open door. I took a few pictures and nothing seemed out of the ordinary. I was looking through the images on my digital to see if they were clear of if I needed to take some more. I decided to take one or two more. . . when I did I noticed a strange shadow appear to one side of the door opening. It creeped me out a bit so I walked away and showed my husband. I told him to go back and take some. . .lol. . . and he did. He did not get any shadows in the pictures. I decided I was being silly and went back to take some on my own. The shadow came back but it was a different shape. There was nothing behind me to make the shadow and it wasn't my shadow. . . there weren't ANY shadows around due to the cloud cover. I have a few pictures if you would like to see them. Just tell me where to post them. I was out there one night with my brother and as we were walking around the cemetery we both had a huge sense of dread come over us. He kept persisting that we leave but I told him that I just wanted to go check out the mausoleum before we headed out, as we approached the mausoleum I snapped a picture, just as I was about to enter we both heard an extremely loud growling noise that scared both of us to death and we took off running. I, after running about 20 feet away stopped and looked back and saw nothing but needless to say we got out of there anyway. It could have been an animal in the woods right there, I'm not sure, but it was definitely pretty freaky that night.